Alongcamepollly: Skin, Glorious Skin!Skincare Masterclass. There are a few things in life you can compromise on, but skincare is something that should always be top of everyone's priority list. In order to choose the correct regime for your skin, you need to decide what type of skin you have, and what your main concerns are. A question I always ask a customer to help them decide is 'if you could change one thing about your skin what would it be?' This will help me recommend the best and most effective regime. First up, how can you tell if you have dry, normal or oily skin? Before I was trained in skincare I always thought I had dry skin, when in fact I don't always. My skin is very changeable, in summer I have oily skin due to the (sometimes) heat, and in the winter my skin can be very very dry and dehydrated due to the central heating and extra layers of foundation to cover up my red nose in the cold! :) So as the months change, so do my creams, as I need to get the best out of them. Dry and dehydrated skin will feel very tight, especially after a shower; if you put make up or moisturizer on and it instantly seeps in to your skin, you may be using too light a cream or foundation. Oily skin will typically look shiny, and in the morning will feel quite greasy. However people can have oily and dehydrated skin. If your make up doesn't last too long on your skin and you feel it lacks radiance, these are typical signs of oily dehydrated skin. 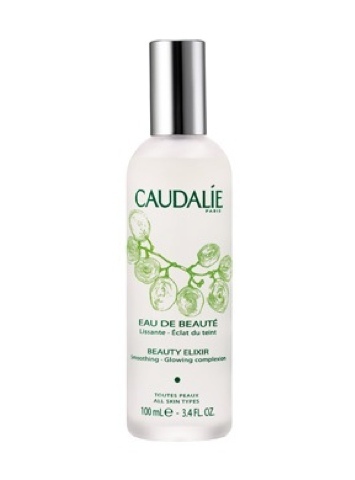 My skincare of choice is a natural French make called Caudalie- it's free from parabens, it's organic and it's made from grapes; it's the best thing I have ever used on my skin. I use the Gentle Cleansing Milk which cleanses the face and eye area very gently, it even removes Benefit's They're real! After using this your skin feels very moisturised and thoroughly cleansed. People with dry skin should always go for a milky or water based cleanser to add moisture to the skin. You might love the feel of a rich milky cleanser but your type of skin does not need any more moisture! You should use a foaming or gel type wash cleanser. This will help remove all excess oil and really clean out the pores. Now toner is something that divides people. Dry skin-ers tend to stay away as it makes their skin tight, however a toner in some form should always be used. Toner closes the pores after cleansing, keeps the skin taut, and restores PH balance after cleansing with water. 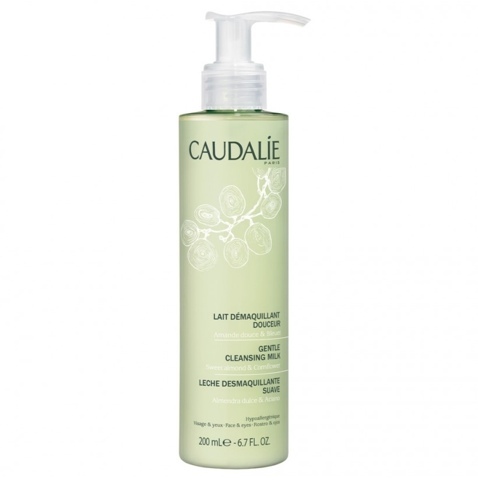 The Caudalie Toner is also very moisturising as it is made from grape water which is very high in anti-oxidants. If I forget to tone after cleansing I reach for my trusty Beauty Elixir -you will hear alot more about this in a later blog-, as it closes the pores and gives the skin radiance. Next up, give me moisture! So after you have decided what type of skin you have and what you want out of your moisturiser then you can make it part of your regime! 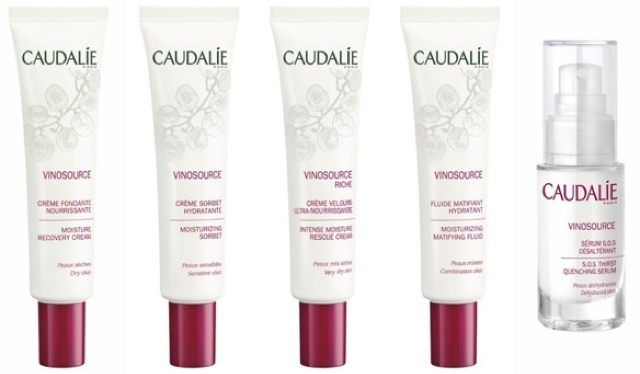 My favourite range in Caudalie is Vinosource. This is a very affordable, moisturising and soothing range with creams for every skin type, winner winner chicken dinner! A cream for very very dry skin; very irritated and sensitive skin; oily combination skin (a big favorite of mine), and one for normal-dry skin. These are all made from the polyphenols or the juice of the grape and are very rich in anti-oxidants which protect from free radicals-the main cause of anti-ageing. I could get all sciency on you but i'll save it for another day! If you have very dry skin, a good serum will enhance the work of your moisturiser. You should only use a pea sized amount for the face patting it on gently and another for your neck gliding upwards. So these bottles should last 4-5 MONTHS! Prices are €24.80 & €31.80 for serum. Of course I am only touching on the basics of skincare, but once you master the basics, get to know your skin, and find a cream that suits you and makes your skin look its best, then you can start introducing more effective moisturizers for anti-ageing or other concerns you have. Ok woah done! Now I have to go and implement all my advice and do my regime..!